Resul Pookutty, the academy award winning sound designer has yet again made the nation proud by receiving one more award adding up to his honor. The Rocheston Accreditation Institute has honored Resul Pookutty with Rocheston’s Distinguished Engineer award, for the immense work he has contributed to the field of sound and music in cinema. Music Director A.R.Rahman, who shares a good rapport with the sound designer wished him for this achievement. 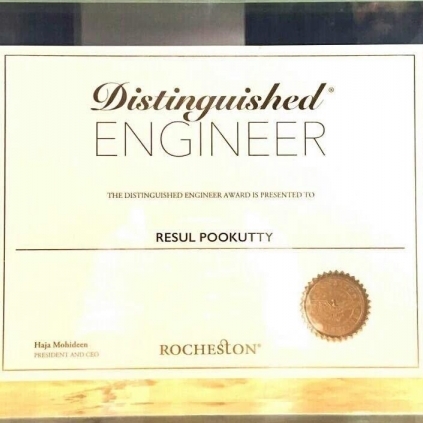 “Congrats Resul for getting the most distinguished engineer award from Rocheston” Rahman tweeted. Behindwoods wishes Resul Pookutty for this achievement. Congrats! People looking for online information on A R Rahman, Resul pookutty will find this news story useful.